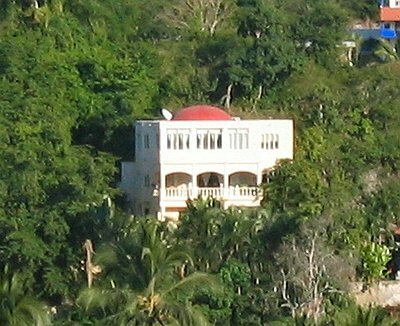 Villa Paloma Suite is one bedroom with a large living area located on the hill side of La Manzanilla with a 7 minute walk to the beach and center of town (F-15 on the map). Right photo is the shared pool. The suite has fans and air conditioning, queen size bed, a jacuzzi , two bathrooms, kitchenette that includes cooking utensils, coffee machine, microwave, electric cooker and grill, a small refrigerator, and sink. A childs mattress is available. 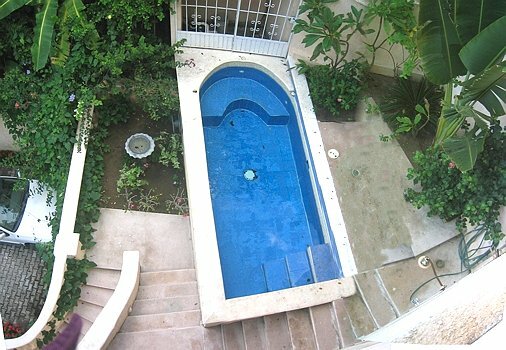 The pool will be shared with the lower apartment. A wall of windows gives plenty of light, air and a spectacular ocean view. On the right is the stairway, then the doorway to the "his" bathroom (not shown) which includes a shower that has a place to sit. Casa Paloma Suite may be combined with Casa Paloma lower for 7 persons capacity.